Even at the genesis of their story as a couple, John and Marlene Boll's relationship was rooted in support and service. In 1952, John, then a young corporal based in Raleigh, NC, and four other young soldiers were heading to the North Carolina State Fair when they came across four beautiful Roxy Theatre summer tour dancers in need of a ride. Then 18-year old Marlene was in that group. John persuaded his friends to give up their seats for the dancers so that he could transport them to the Fair in time for their afternoon show, and so began a 64-year strong love story that has in many ways always centered around lifting those in their presence, up. After this first encounter, and a subsequent appearance as a Roxy-ette on The Ed Sullivan Show, Marlene would advance her dreams of dancing professionally by landing a job as one of the world-famous Radio City Music Hall Rockettes. John visited New York City as often as possible for a front-row seat to Marlene's performances, fulfilled his service in the armed forces and ultimately asked Marlene to marry him and move to his hometown of Roseville, Mich.
She said yes and they returned to Michigan, where John made good on his vow to build a beautiful life. John launched a construction business, Lakeview Excavating, while Marlene indulged her love of dance with a studio of her own and involvement in competitive dance coaching in local high schools. They grew a beautiful family of three children -- John, Lora and Kristine -- and the couple worked diligently to evolve the business into what would become the country's largest 5-star manufactured home community development enterprise, Chateau Properties. But when they recall those years of hard work and significant success, they say that their primary focus was always family and making a positive impact on the lives of others. As they grew their business, they grew in their giving. In 1985, they established the John A. and Marlene L. Boll Foundation, which focuses on the promotion of moral and educational values, as well as community enrichment, in the state of Michigan and throughout the world. Through the Foundation, The Boll Family has long been a generous supporter of University Liggett School, from which six of John and Marlene's eight grandchildren have graduated. The University Liggett School's John and Marlene Boll Campus Center was made possible by a $4.25 million gift from the Foundation, which is the largest single gift in the school's history. Prior to that, a $1 million donation from the family allowed the school to create a department of student support that enhances the educational experience for all students in all grades. Gifts come in many shapes, sizes and forms," says John Boll. "The only true gifts are those that go on long after they are given. As God has entrusted our family with much, we now leave a legacy to ensure that a superior educational institution will continue to champion the finest qualities of achievement, of excellence in sport, of character and of creativity." 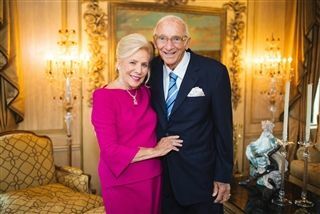 John and Marlene Boll's dedication to uplifting the community at large and enriching the University Liggett School community, specifically, is a model for the service-filled life. What began as a chance opportunity for a young man to help a young woman get from here-to-there has blossomed over the decades into a powerful partnership that helps institutions and organizations get from better to best...and we at University Liggett School are deeply appreciative of their support.